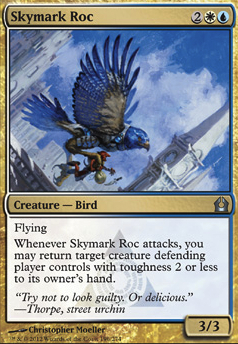 Whenever Skymark Roc attacks, you may return target creature your opponent controls with toughness 2 or less to its owner's hand. Maybe some angels. I like Baneslayer Angel and Akroma, Angel of Wrath. 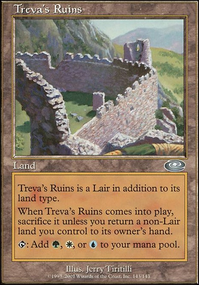 Ik you said only fliers, but Magus of the Moat is a card made for a fliers deck like this one. Mindshrieker can be great if you are getting hits in, and if you want to counter enemy fliers, I like Archetype of Imagination. Mist Raven, Skymark Roc and Spire Patrol are all creatures that I consider. I like the flash on Restoration Angel; while it's limited on what it can blink in the deck because I have a lot of other angels, being able to surprise someone with it cannot be understated. I actually decided to swap out Skymark Roc with Windborn Muse; it doesn't change the curve of the deck at all, and while it's not as aggressive a card, it is a nice addition to the toolbox. I was thinking about it, trying to come up with a card that I would want to search for with Isperia the Inscrutable, and having an answer to infinite tokens and other 'go-wide' strategies in the deck outweighed the benefits of another 'peek/bounce' effect. I've certainly thought about Brago, King Eternal, but I don't really have the budget for him, and he does also generate a bit more table hate than I think I could withstand by virtue of his ability being so clearly powerful. To be completely honest, I'm not seeing the birds (Aven Mimeomancer and Skymark Roc) to be all that impactful in the games I have played with this deck. Generally, it seems that they have almost no impact until I have already far surpassed my opponent. 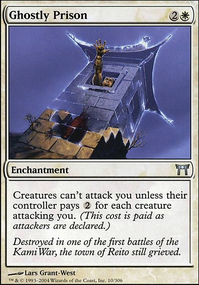 I'm wondering however, if I was facing decks with more controller or that were better fit to subdue my attacks, if they might be useful to break a stalemate and give me the edge. Or perhaps it would just be better to run control of my own to prevent the opponent from dismantling my set up with something like a board wipe as bjohegstad suggested. Keep in mind, however, that this deck is aggro and (if all goes well) tends to win by turn 6. This means that anything too complex of tricky to set up (things like delerium) will likely not be useful in time to save them. Most of the problem comes from 4-drop board wipes and enchantment/artifact removal. A simple counterspell seems like it would do the job fine but in reality saving the 2-3 mana it would take to keep one at the ready is simply to hindering to the play style. 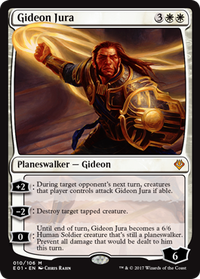 Kira, Great Glass-Spinner would be useful, but even then wouldn't stop a board wipe. Is there anything anyone would suggest to help? Yah I like Biomass Mutation better, I switched them out. Also I'm thinking -2 Skymark Roc for the +2 Hidden Strings as I rarely get to use Skymark Roc anyway. Thanks Brandon! I will try to improve it, what do you think of Skymark Roc? I think it is useful, but im not sure cause 2 toughness is kinda low. Judge's Familiar over Aven Skirmisher. Windbrisk Raptor is probably way too expensive, and Impaler Shrike is just outright bad because of how easily it is removed while costing 4. If you really need the card draw, Messenger Falcons may be a better choice. Skymark Roc can be a good way to slow down your opponent in the midgame, and it has a decent body. 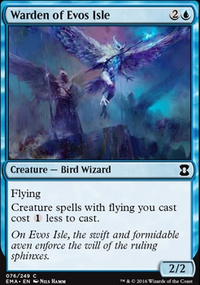 While not a bird, Thistledown Liege may be a better choice than Favorable Winds, as Favorable Winds needs creatures on the board to be good, while liege is a body on it's own. 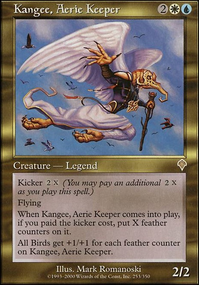 Also, it buffs both blue and white creatures, so Messenger Falcons,Skymark Roc and Judge's Familiar get twice the buff. Having flash is also nice as an EOT play, or to use it against any Pyroclasm effects that would be sided in against you.